There are well over a hundred United States military installations that have been identified as contaminated by the Environmental Protection Agency. Many of which, were identified after decades of activities and exposures to our nation’s military service men and women. 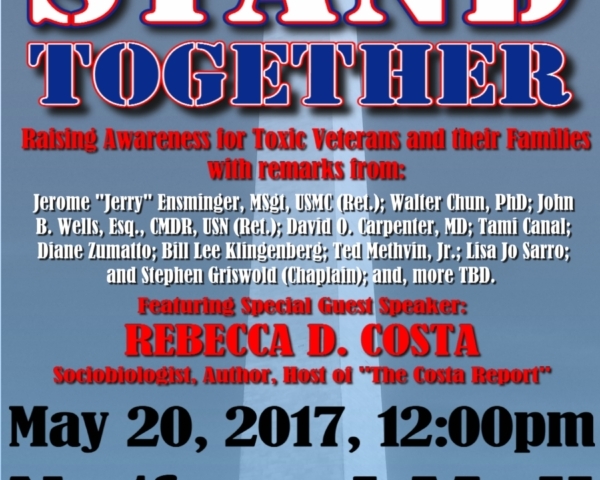 Additionally, thousands of combat veterans were exposed to toxins, ranging from Agent Orange in Vietnam to the recent burn pits in the Gulf War. Sadly, many of the affected veterans are seriously ill, disabled, unemployed, and dying as a result of their exposures. The effects have caused cancers and disorders involving the following systems: neurological, reproductive, respiratory, hematological, musculoskeletal, and gastrointestinal. Notably, these veterans are experiencing a combination of rare disorders and diseases, rather than a single issue. In many cases, the effects of their toxic exposure have been passed on to their descendants. In spite of several efforts to enact necessary legislation that would acknowledge these atrocities and provide the necessary relief and assistance, the majority of legislative bills are ignored and passed over. 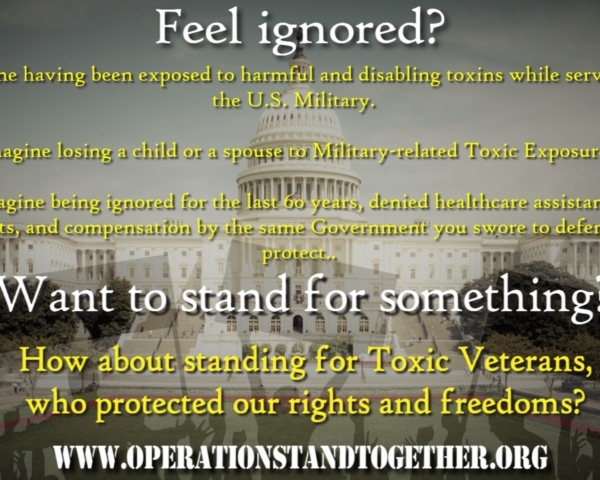 OPERATION STAND TOGETHER represents the collective interests of United States military veterans and their families, who seek to raise awareness to chronic, life-long illnesses and disabling conditions directly resulting from nuclear, biological, and chemical toxin exposures during their active duty service. To that end, we welcome members from all branches of service, as well as their family members. 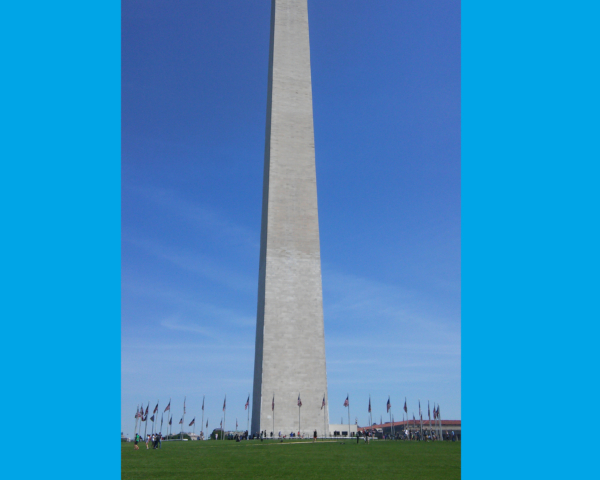 By raising awareness and respectfully voicing our experiences and concerns in an organized, patriotic, and democratic manner, our goal is to significantly improve the lives of those affected through national recognition, legislative reform, healthcare assistance, and disability compensation for those in need. 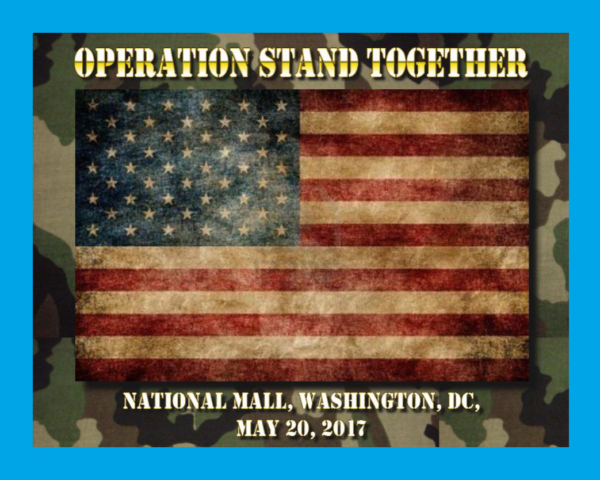 A culmination of this effort will be a one-day event, which is being planned for May 20, 2017 at the Sylvan Theater on the National Mall, in Washington, D.C. The FREE, family-friendly, public event is anticipated to include: guest speakers, a variety of musical entertainment, independent films and videos, and information booths. Our guest speakers will include an array of topics and experts in public health and military contamination, members of Congress, and several activists. The musical entertainment is mostly regional acts to maintain a reasonable budget. The independent films and videos were created by participants in the event. Our initially-projected expenses included, but were not limited to: professional stage sound & lighting, portable restrooms, First Aid station & EMS support, video projection screens, small tents/tables/chairs, liability insurance, musical performers, guest speaker overnight accommodations for one night, stage design, marketing and public service announcements. To date, we’ve conservatively estimated those expenses to range within $50,000 – $75,000. Absolutely 100% of any received donations will be used for the expressed purposes, as outlined above. No administrative fees will be assumed by any of the persons involved with the event’s organization. Any donations received in excess of the event’s total expenditures, will be appropriately dispensed and distributed to long-standing, reputable non-profit organizations with 501(c)3 or 501(c)19 status for the expressed purposes of aiding or assisting United States Veterans. 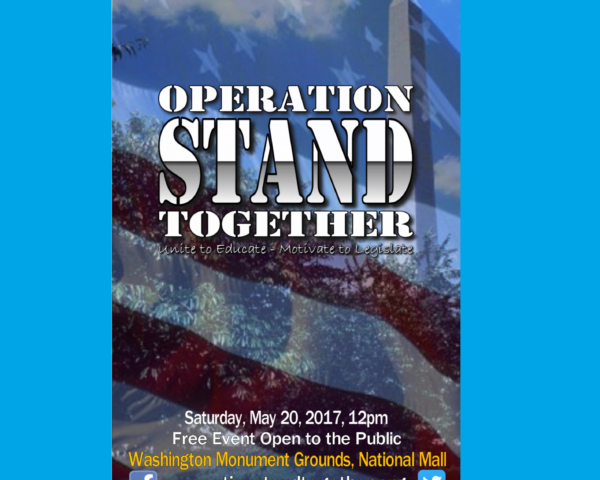 As many of the affected veterans are chronically-ill and disabled, we are committed to hosting a FREE rally. We feel the veterans’/event attendees’ money would be better spent on their current medical needs, past medical expenses, and travel to and from the event. Personal expenses among attendees will include travel, hotel accommodations, meals, and ground transportation. While we may not be able to assist with individual attendee travel expenses to participate in this one-day demonstration of free speech, we want our attendees to experience a meaningful, well-planned event to further promote public awareness and motivate change. Your best gift, of any amount, will be tremendously appreciated and will be used to assist in hosting this event. The importance of this event cannot be overstated. Toxic veterans and their family members deserve justice and an improved quality of life. 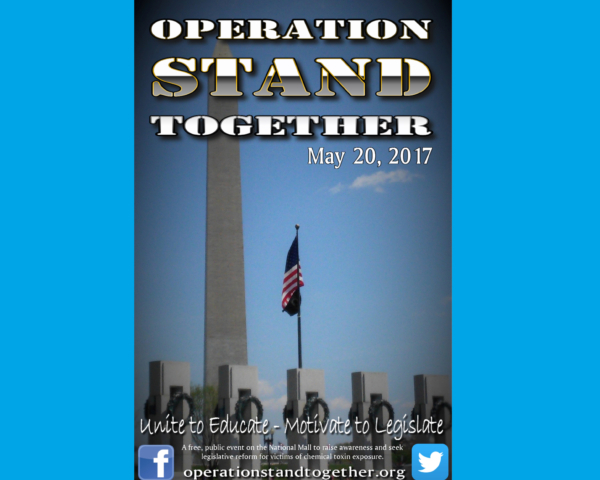 Please visit our website at http://www.operationstandtogether.org for more information or contact us.